General Characteristics: Closely resembles Pika Kea, but maturing within 12 to 15 months; differs in having white petiole base and chalky white corm flesh. Petiole: 60 to 95 cm. long, light green, pinkish red at edge, usually with adjacent dark green blotches especially near base, white at base. Leaf blade: 30 to 45 cm. long, 25 to 35 cm. wide, 20 to 35 cm. from tip to base of sinus, ovate, pendant, light to dark green; piko whitish; lobes narrow and obtuse with narrow sinus. Corm: Flesh chalky white with light yellow fibers; skin cream-colored. Origin, and derivation of name: Native variety; Keokeo, meaning light or white, refers to the corm flesh. 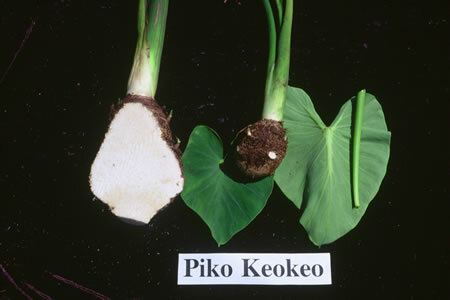 Distribution: Mainly as a mixture among other Piko varieties. Use: Makes fairly good poi.